Rig/Type: Wickes/Clemson Class Destroyer DD-277 Cause of Sinking: Blown up for the movie "Hell Below"
The Moody was sunk for the 1933 MGM production of "Hell Below" starring Jimmy Durante and Robert Montgomery. You're about to see a few scenes of the movie edited together to show the Moody blown in two and the wreckage taking the final plunge to the bottom. Click here to watch the Moody sink! The USS Moody (DD 277) was laid down by Bethlehem Ship building Corp., Squantum, Mass, 9 December 1918 and launched 28 June 1919, within a half hour of the Henshaw, another four stack destroyer. The launch was sponsored by Miss Mary E. Moody, sister of Justice Moody, a former US Supreme court justice and Secretary of the Navy. Commissioned at Boston 10 December 1919 with Comdr. James D. Wilson in command, she was assigned to the Pacific Fleet and the Moody departed Boston 9 February 1920, loaded torpedoes and ammunition at Newport, R.I., and steamed via New York, Guantanamo and the Panama Canal to the west coast, arriving San Diego on the 31st. The flush-decked four stacker operated along the California coast through June and then departed San Francisco 1 July for Washington where on the 10th she went on an inspection tour of Alaskan coal and oil fields and looking for possible fleet anchorages, touching nine ports including Sitka, Duncan Bay, and Juneau. Returning to San Diego 31 August, she operated off the California coast in training and in battle exercises until her decommissioning 15 June 1922. 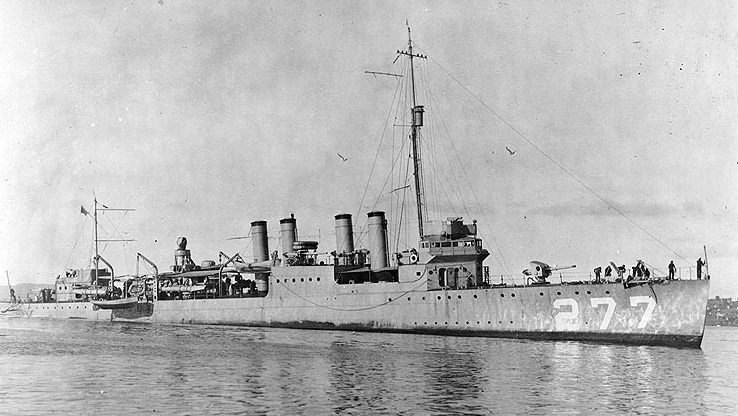 The destroyer was decommissioned 27 September 1923, with Lt. E. A. Zehner in command. Assigned to Destroyer Squadrons, ship operated along the Pacific coast and fleet exercises in the Hawaiian Islands, Pago Pago, Samoa, and then made good will visits to Melbourne, Australia, and Dunedin and Wellington, New Zealand. Returning to San Diego 26 September, Moody then resumed west coast operations into 1927, including a voyage to Panama between February and April 1928. On 17 February 1927, she sailed from San Diego for tactical maneuvers with the U.S. Fleet in the Caribbean. Proceeding through the Panama Canal 4 March, she arrived Guantanamo 18 March and operated out of that port and Gonaives on Fleet Problem 7, involving the defense of the Panama Canal until 22 April. She then proceeded to New York for repairs, sailing for home 16 May, arriving San Diego 25 June. In March 14, 1928, the Moody was chasing down a torpedo during practice off Pt. Loma when it suddenly turned into the starboard side and struck the Moody. Although the torpedo was not armed, an explosion took place, severely denting the hull and damaging the starboard strut. Soon after, the disabled destroyer was taken back to Mare Island for repairs. Hawaii with the fleet for the extensive exercises of Fleet Problem 8. She sailed to Mexico and Panama in early 1929 and then in July cruised to the Pacific Northwest, as far north as Ketchikan. The Moody was again decommissioned at San Diego 2 June 1930 and was towed to Mare Island Navy Yard arriving on the 8th. The destroyer was struck from the Navy list 3 November and scrapped in accordance with the London Treaty limiting naval armaments. Most of her superstructure was sold as scrap metal 10 June 1931. She was headed for the breaking yard when MGM purchased her for about $35,000 for a movie based on the Commodore Edward Ellsberg's "Pig Boats" which became the 1933 movie "Hell Below" starring Robert Montgomery and Jimmy Durante. She was towed from Mare Island into Craig shipyard and reworked to represent a German destroyer for the movie. To simulate her sinking by "torpedoes" by the American submarine, AL-14 (played by sub S-31), Merritt-Chapman & Scott Corporation, were hired for the sinking. A charge of dynamite was placed on board just aft of the bridge. Shortly after noon on February 21, 1933, the Moody was blown in two. The explosion was placed between two water tight compartments so she would continue to float after the explosion. Two other explosions took out the water tight bulkheads and the Moody finally sank at 5:30 that evening. Some dozen boats, many with newsmen hoping to film the sinking destroyer hovered around the film crew, creating a nuisance. Threats were exchanged, but the filming was done. 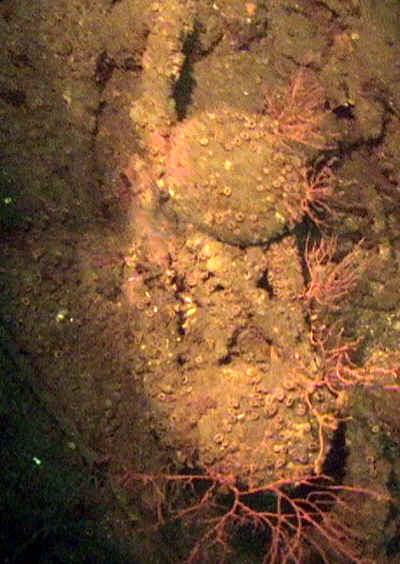 The following day, with bubbles and oil still coming to the surface, the wreck was wire dragged and found that the minimum depth exceeded 90 feet. Basic Wickes/Clemson Class hull/deck lines. Rediscovered by local wreck divers in 1973, the Moody, resting in 140 fsw, is strictly a dive for the experienced diver. The wreck is broken in two sections. Given the depth, the Moody has remained protected from any surf, however, the once intact hull sections have collapsed downward. The bow, twisted and lying on its side, has formed a bowl in the sand down to 150'. 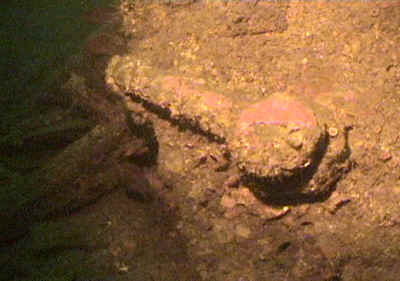 The stern lays upright, complete with propellers intact, but buried in the sand. The two sections lay parallel about 100 feet apart and divers sometimes tie a line between the two sections. An anchor shackle was mounted into the bow for towing. View through one of the torpedo tubes. 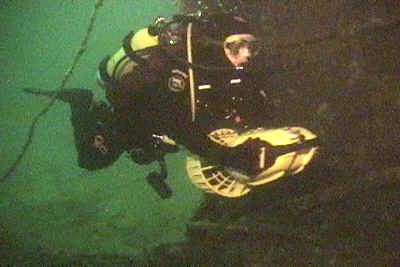 A diver explores the wreck. A bollard (or bitt)--note the cable still attached. Lying several miles from the shore, the waters are unprotected and strong currents can arise. Visibility at this remote site is usually good, averaging over 25'. 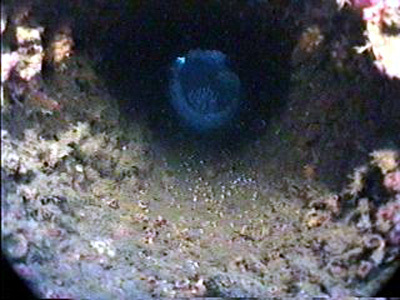 However, the tall water column above absorbs most of the light, and the use of a dive light may be necessary. On some occasions, visibility may exceed 50' and there are even stories about divers being able to see both sections at once--over 100' of visibility! 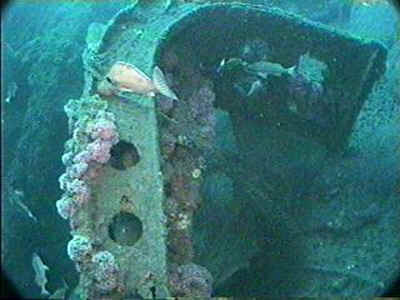 The four-stack destroyers were virtually made of brass--its main attraction for wreck divers. Others found it to be one of the few areas in Southern California with a dense population of tall, white stalks of Metridium anenemes. Whatever its lure, the depth, limited visibility, and sudden strong currents have claimed more than one over confidant diver's life. But it's a thrill of a wreck dive, guaranteed. Also see the Honda or Hogan pages for other local four-stack destroyer wrecks.